The end goal of finance and accounting is to keep records, and make sure activities are sustainable for some given period. This happens when costs are examined and budgets are created. Activity Based Costing (ABC) - Another alternative method of tracking costs in order to see how profitable a product or customer is. All activities are assigned a cost. A percentage of each activity used to create a product or service can then be summed for an overall cost. Budgets are used to regulate work done and money spent. Budgets are also where most assumptions that are made come into play. The two main goals of any budget are planning and control (goals and satisfying goals). A general master budget can be broken up into many smaller budgets. This helps organize the task and ensure its correctness. 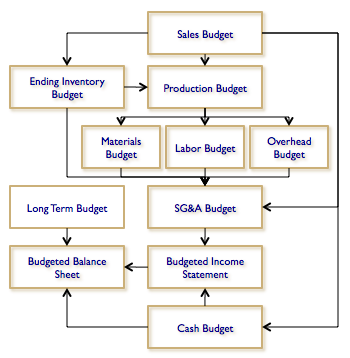 An additional step that is often used when creating a budget is that of flexible budgets. A flexible budget is a budget based on activity ranges. Instead of creating one possible sales figure, or production figure, a few range or checkpoint numbers are chosen and a budget line is created for each of these.